Continued from Stage 29 - page 2. In the 2nd century the Romans built a bridge across the Río Miño which was later to be destroyed by Doña Urraca the Queen of Castilla to prevent her husband's (Alfonso el Batallor) troops from advancing. As we mentioned in an earlier stage they didn't particularly like each other and were at war. 8 years after she destroyed the bridge Doña Urraca ordered a new one to be built and the same builder would later build one of the pilgrim hospitals. If you come on the Camino when the river is low you will be able to see the old bridge next to the new one. The town you see before you today dates mostly from the middle of the 20th century with much of the old town now below the waters of the Miño. 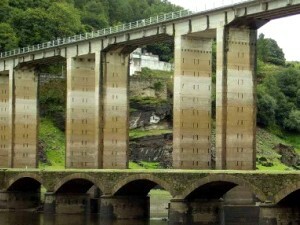 In the 1950's Franco decided he wanted to build a hydro electric dam 40 kilometres down river and in doing so would flood the town of Portomarín. The townspeople wanted to save some of their most important monuments and transported these stone by stone up to their new home high above the river. The monuments brought here were the churches of San Nicolás and San Pedro and some of the important 16th and 17th century manor houses or Pazos. As you first come across the new bridge you come to some steps up to an arch where you will find the Iglesia de Santa Maria de las Nieves, built on the site of a former pilgrim hospital. The staircase is actually the sole remaining part of the original 2nd century Roman bridge which was destroyed by Doña Urraca. Locals believed that the Virgen de las Nieves protected them from drowning and therefore built a shrine to her part way across the old bridge. 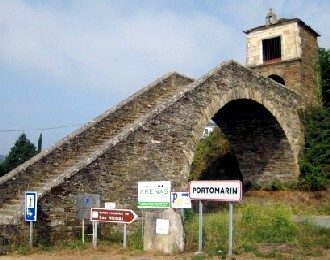 When the dam was built the shrine was moved along with the span of the old bridge and placed here as the entrance to the new historical centre of Portomarín. As you climb the steps you can choose to continue on your way along the Camino by going left or alternatively take a right once through the arch into a park and into the remains of the old town. 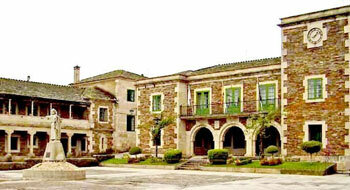 The large square in the centre of town contains most of the historic monuments including the Pazo del Conde da Maza. In front of the Pazo is a statue of Santiago indicating the way to the Camino. The 12th century Igrexa de San Nicolás is like many other churches found in towns controlled by Knights, a fortified church. When it was in the original town it was known as the Igrexa de San Xoan (San Juan) and was controlled by the knights of St John of Jerusalem who also controlled the bridge across the Miño and one of the pilgrim hospitals. The church was built by a student of Mateo who created the Pórtico de la Gloria in Santiago Cathedral. If you look closely you may still make out the numbers which were carved into the stone prior to them being brought here from the old town. 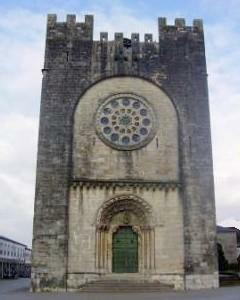 Another of the churches brought from the old town was the Igrexa de San Pedro. 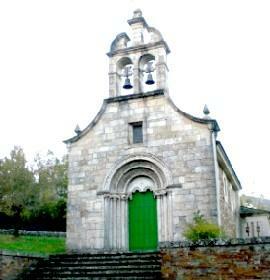 This church was built in the 10th century and consecrated in 1182 by the Bishop of Lugo, Rodrigo II. As you will begin to see on your Camino through Galicia this church is built from granite which is abundant in this part of Spain. The town has at least 7 albergues to choose from and about 3 hostals. In terms of food there are a number of restaurants, many of which offer a pilgrim menu, and cafés to choose from. If you are running a little low on cash there are also a few cashpoints (ATM's).